A social media policy is a document designed to protect organisations and employees when they're using social media on behalf of the business. It should advise and guide employees on how to conduct themselves online, but it should also empower your colleagues to deliver engaging social media content. When writing your policy document you need to consider the best approach to empower your employees whilst putting a serious point across. Setting an appropriate tone is a vital starting point in ensuring that you get employee support and buy in. The tone needs to reflect your organisation’s personality, a great example of this is Adidas’ social media policy which is written in first person using ‘our’ ‘we’ ‘us’, which creates a sense of community and equality between the enterprise and it’s employees. On the other hand, the UK Government's Social Media Guidance for Civil Servants takes a different, more serious tone, reflective of the organisation. For any organisation a policy should explain clearly the expectations and precedent for how social media is planned to be used. It should be made clear to employees the tone of voice, the audience and the language that should be used when posting through the corporate social media channels. For example, if your company has multiple brands each with their own social media channels and specific audiences, you will need to make clear the differences in each channel. It will also be important to set out some guidelines in how to engage with your audiences e.g. knowing when to respond, as well as how to deal with a crisis. Ensure that your social media policy clearly defines not only how you expect employees to post through your corporate social media channels, but also guidance on their association with your organisation, through their own personal social media accounts. The lines between personal and professional are increasingly becoming blurred, how people present themselves on their “personal” social media channels can often stretch over to their “professional” interests and can potentially result in negative consequences. A common example of this is political viewpoints, where an organisation may wish to remain a-political in order to avoid isolating any of their customers, whereas employees may feel particularly empowered to support certain political parties. Whilst there is the option for employees to post a disclaimer “views are my own” this does not hold much strength in a legal dispute. 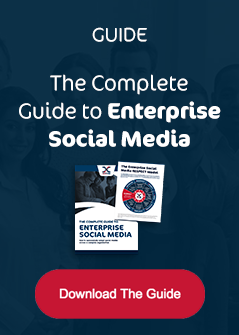 A key element to delivering successful social media in any enterprise organisation is defining the key roles and responsibilities, which need to be clearly outlined in your social media policy. Your employees need to be clear on the chain of command, when is the appropriate time to escalate a situation/seek further guidance and be aware of who the right person is to ask. It will be important to include clarity on who is responsible for the training and education regarding your policy document, branding enquiries, customer service, security protocols and most importantly who is enforcing the policy. 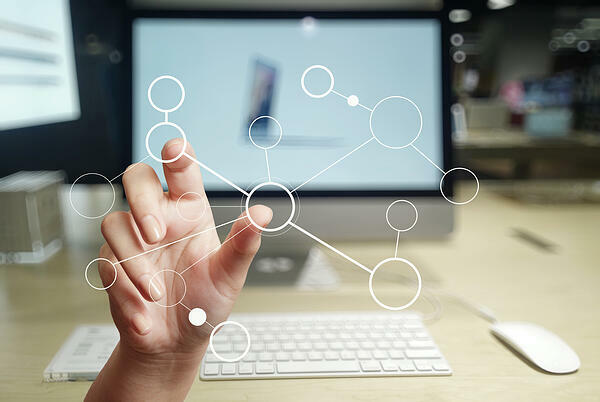 Similar to your organisation’s IT policies it is important to provide guidance on the safety and security protocols in order to reduce the level of social media risk. When multiple employees are accessing corporate social media channels, often through a single point of entry – direct access to the native social media channel (often using a shared password) this can create a significant level of risk! Outline in your social media policy the steps that are to be taken to reduce this risk, for example by utilising your social media management software with personalised logins, as well as providing advice on secure password protocols. In addition you need to clarify what information is available for public consumption and what needs to remain confidential to avoid any embarrassing and potentially costly mistakes. A social media policy needs to be clear and practical to ensure it’s success. Try to avoid creating a lengthy novel with complicated terminology that many of your employees might struggle to understand. The document needs to be written with them in mind, your employees need to understand it clearly before they can sign it! We would always recommend that you seek professional advice when finalising your social media policy. Involve your HR, legal and IT teams to ensure that all the bases are covered, and that the policy is achieving it’s purpose of protecting your organisation. When devising your social media policy, take into consideration how it will be implemented, will it form part of your recruitment process? Will it be reviewed in performance appraisals? Following on from ‘Definition of roles’, establish who will be responsible for implementing the policy (does it sit with HR, marketing or the employee’s line manager?) It will also be important to establish a process of enforcing it to avoid it becoming redundant. More often than not when we work with organisations supporting them on their social media strategy, when asked if a social media policy is in place, the Marketing / Digital / Social Media manager will admit that there is a policy that was developed… back in 2014. Social media is a dynamic channel with new technologies and applications constantly being introduced, it’s important to make sure that your policy is up to date and fit for purpose. Finally, a social media policy is a living document that needs to contain a degree of flexibility. 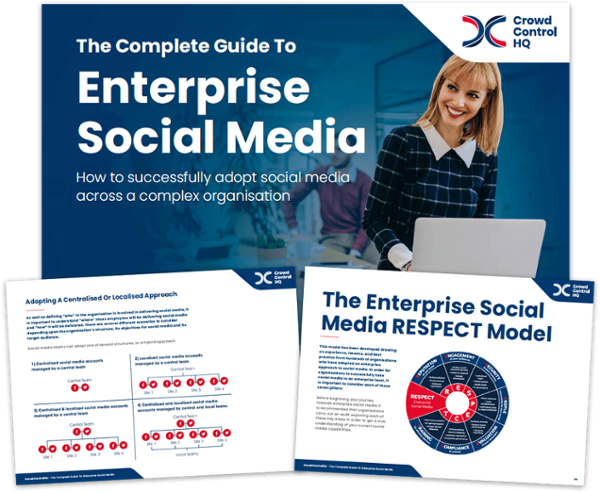 Aim to provide guidance rather than a strict set of rules, this will enable your employees to feel empowered to deliver social media rather than too frightened to embrace it!